Greg diagnosing the engine problem. March 13 – March 22. Greg is on deck hammering, scraping, drilling, and filling the holes the stanchions are screwed down into to with something called Butyl Tape. He is fixing leaks, continuing to strike off items on our endless chore list. I am down below making vegan sausages and trying to catch up on the blog. We have been so busy with chores; we have let the telling of the adventure get away from us. Some cruisers stop by in their dinghy to chat. They ask about where we keep Blue Wing during hurricane season. They have just come back from the Bahamas and are heading home to Missouri. Their sailing season is over. Ours has just begun. 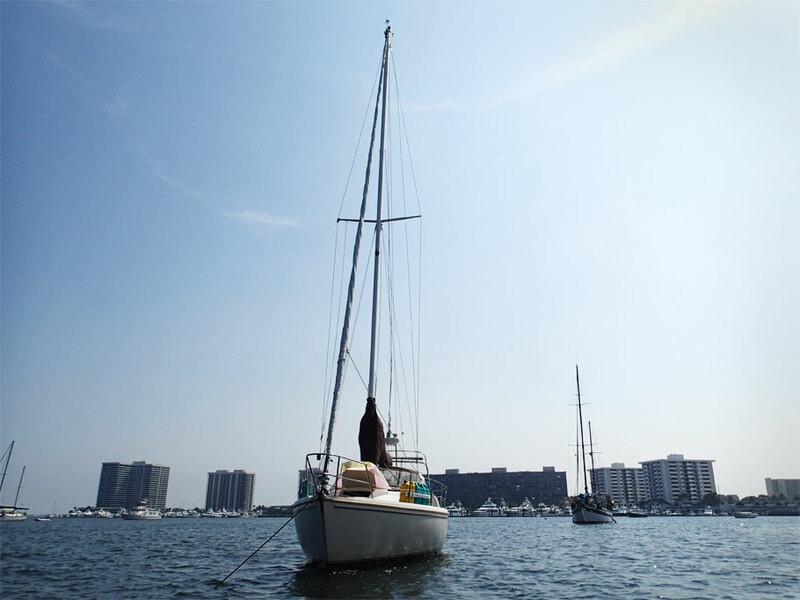 We cast off from our mooring ball and left Sunset Bay Marina on Friday the 13th. With adventure swift on our heels, this day of ill luck almost lived up to its bad name. 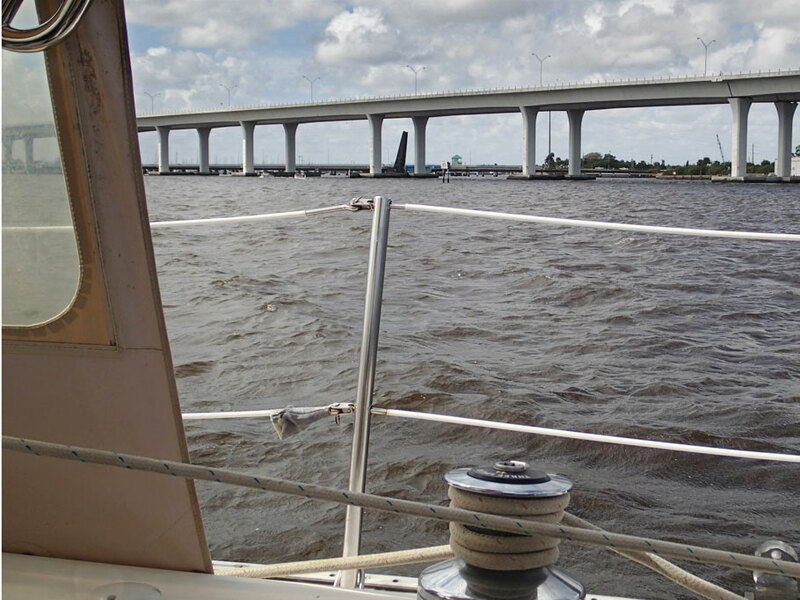 As we motored through the three bridges (a bascule bridge, a train bridge, and a tall fixed height bridge) that pile up right together across the St. Lucie River, Blue Wing felt sluggish. I thought it just might be me being too timid on the throttle, but once on the other side of the third bridge, I turned to Greg, â€œDo you smell that?â€ I asked. Always a bad question, he did smell â€œthatâ€ and immediately jumped down below to take a look at the engine. 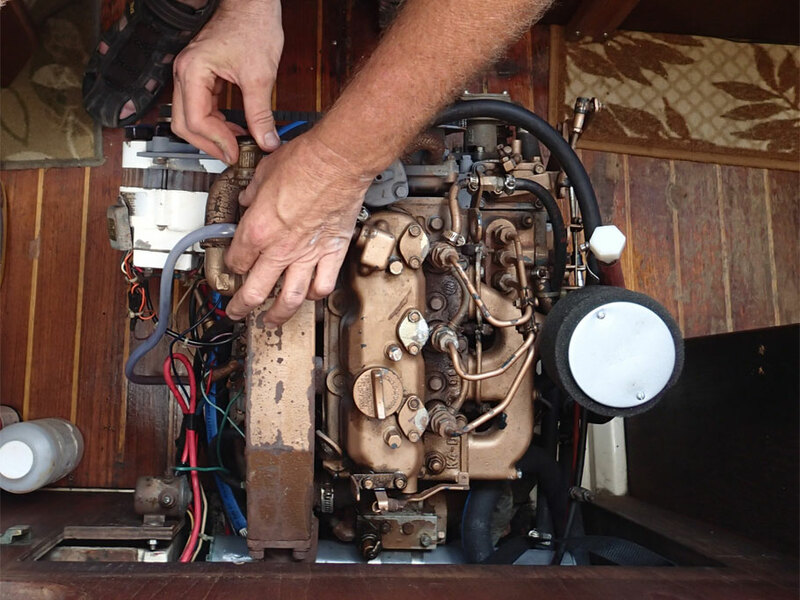 As he pulled the engine cover off and I saw the foul smelling smoke waft up and out the companionway, I throttled down. And the engine stalled. We were dead in the water. Our first thought was to get the boat under control be raising some sail. 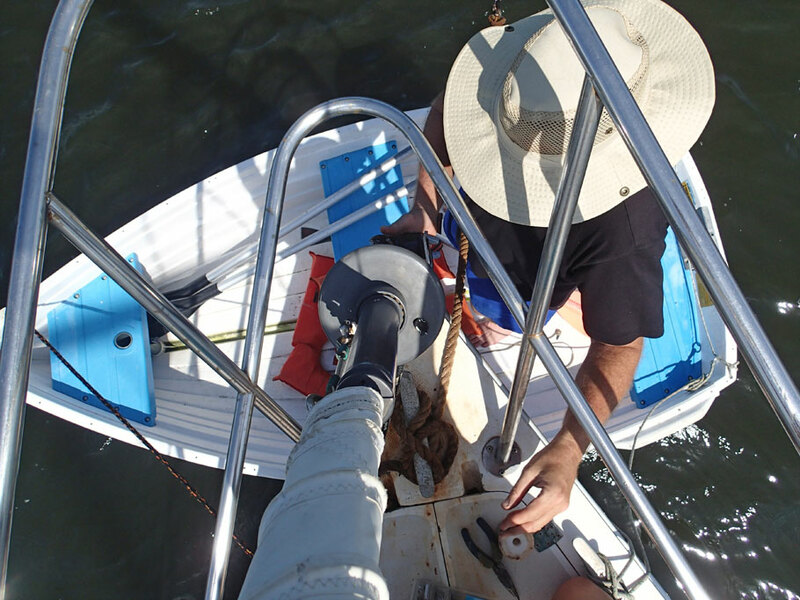 We tried unfurling the headsail, but it was stuck. We turned to the main, but it still had its cover on and was taking too long. We were drifting towards the shallows. So we dropped the anchor. It was a long day. Three trips to Home Depot, and of course, Hoss forgot to leave the valve open. Now I do idle the engine for a while every time I make a change, but a diesel engine just doesnâ€™t get hot unless itâ€™s under a full load, so the first time it was warmed up was today. I checked a few other things before remembering the valve. Then after the â€œaha,â€ opened it and we tied again. We overheated immediately. After adding about a gallon of anti-freeze we tried one more time. This worked fine. 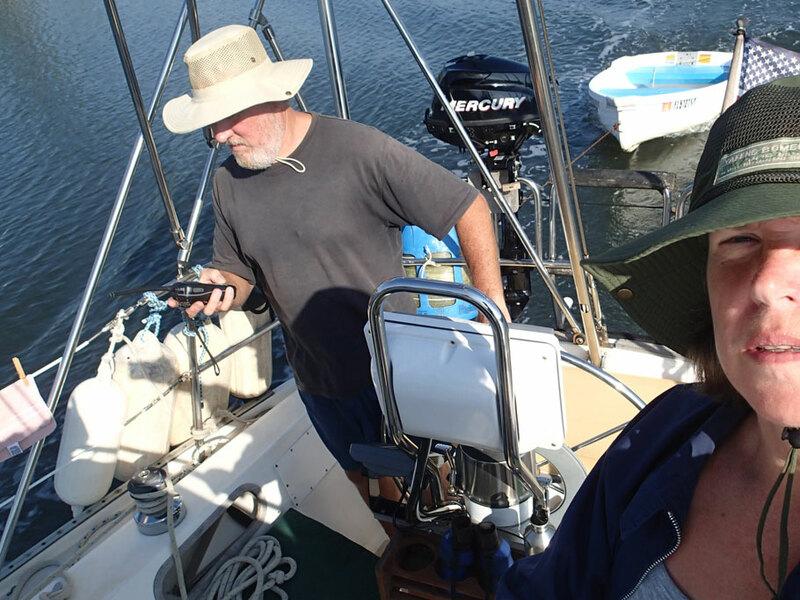 With the excitement for the day out of the way, we made a new rule for ourselves, always be ready to sail, so we readied the main sail and continued on our way to our first destination â€“ Peck Lake. Peck Lake is a small â€œlakeâ€ off the ICW in Hobe Sound (not far from Stuart). 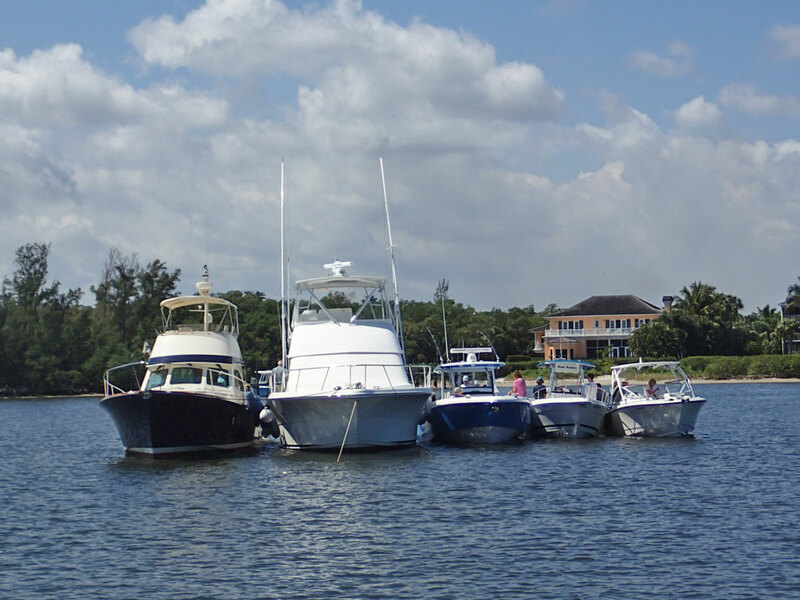 It is frequented by local weekenders enjoying water sports and trips to the beach, as well as a cruiser stop over while traversing up or down the ICW. 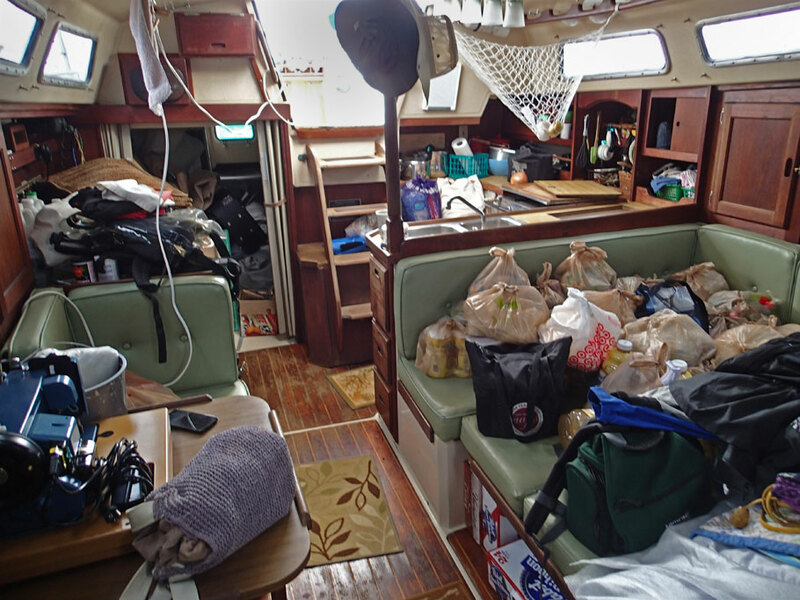 We spent a few days there exploring and putting away all of our food and possessions we had piled in the boat just days before. After getting all of our stuff stowed and doing a little exploring we found we needed to do a few land chores, buy some forgotten items, dispose of our trash and spend some concentrated time on the internet (more than our data plan on our phone allowed) to do some research, file our taxes and catch up on the blog, so we continued down the ICW to Palm Beach Gardens where we knew there was â€œunofficialâ€ shore access at a bridge near the anchorage at North Lake Worth and a library in walking distance â€“ and as an added bonus, also accessible by foot, a Trader Joe’s where I could stock up on fresh veggies, tofu, and tempeh. 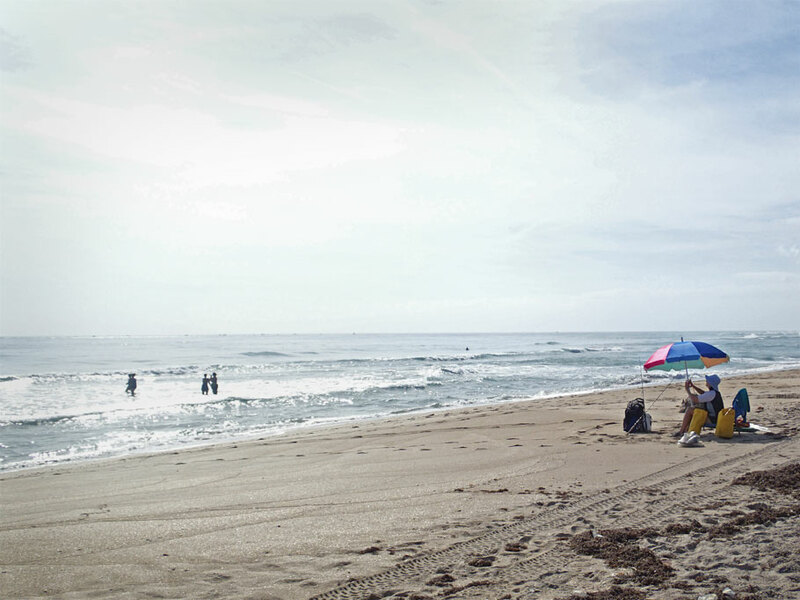 We have now been in North Lake Worth for almost a week, availing ourselves of the library and a nice walk almost daily. Most of our land chores are nearly done. In the next few days we will continue our journey south to Miami, where in a few weeks we will meet some good friends who are coming to spend a few days with us on Blue Wing. Then it will be back to our chore list, which continues to grow, until we cross that next bridge where adventure awaits. Anchored beyond the bridges with engine trouble. You can see the tall fixed bridge, the open train bridge and the tower for the bascule bridge. We were so lucky the engine didn’t cut our any earlier. So much stuff to put away! So many chores. Greg fixing the bow roller at Peck Lake. The beach at Peck Lake. A ferry runs back and forth from a marina across from Peck Lake to the beach. Peck Lake is a busy place on the weekends. Here, 5 power boats are rafted up. Jet Pack! Sometimes you see some pretty wild things on the ICW. 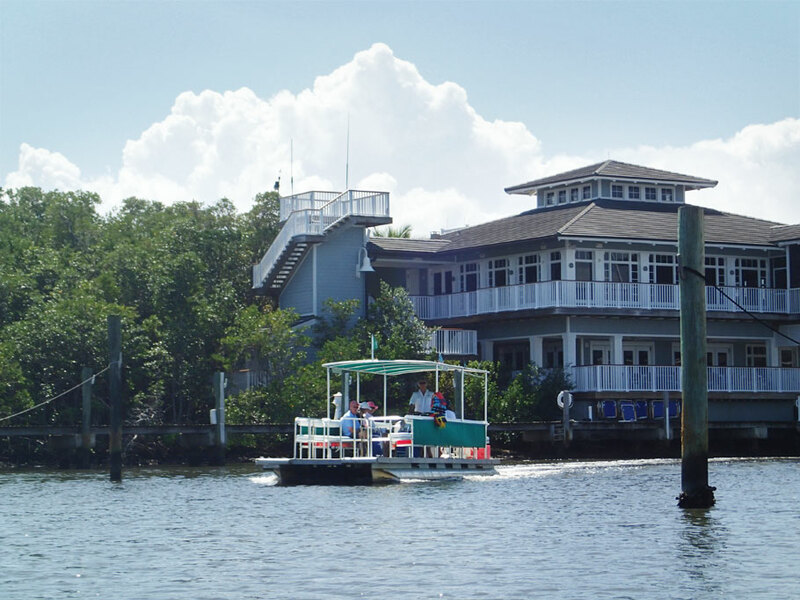 Greg and Duwan cruising down the Intracoastal Waterway. 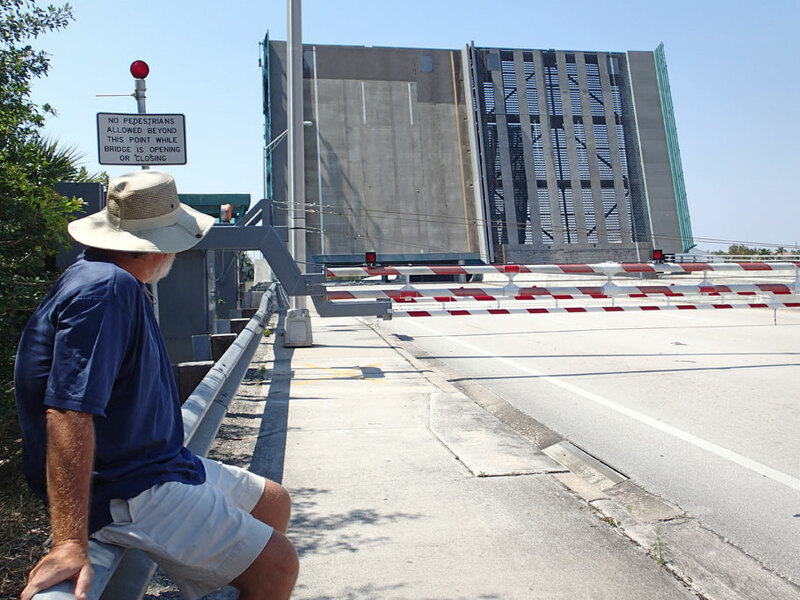 Greg is hailing one of the many bascule bridges we must cross. We wait for bridges on land also. A view of the ICW from the PGA bridge. 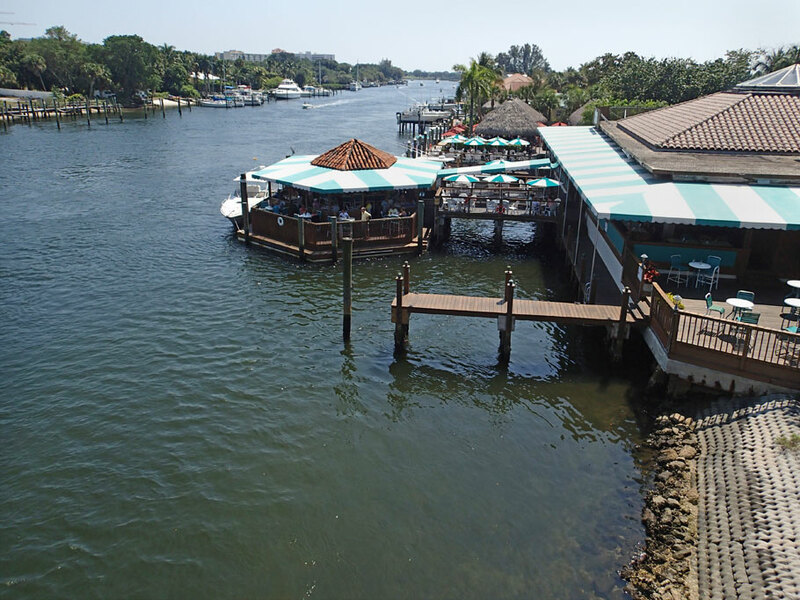 Blue Wing in North Lake Worth. It is so odd for us to be living on the water, but so close to civilization. 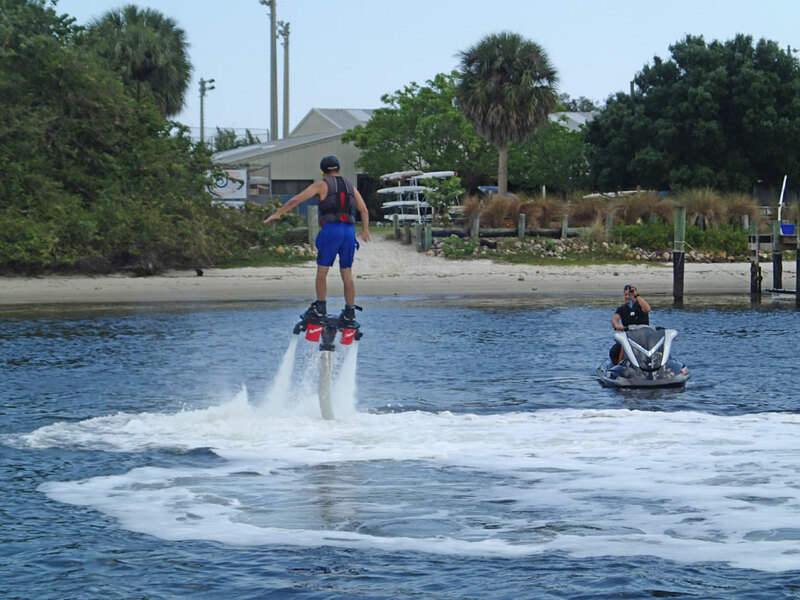 This entry was posted in Boat Projects, Florida on the Water, Intracoastal Waterway, Lake Worth, Life on the Water, Peck Lake. Bookmark the permalink. I am so enjoying your news. You are 2 of the most resourceful people I know. Hope you enjoy your travels and your friends. Get in touch when you return. Meantime, have a wonderful time.